As well as crews who work together on an ambulance, we have staff who work on their own. These are known as single responders. 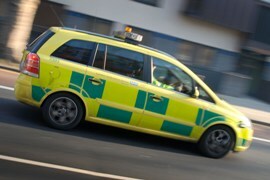 They are able to treat patients without the help of an ambulance crew, or are sent to a patient ahead of an ambulance. They will go to patients by car, motorcycle or bicycle. All of these vehicles carry the vital life-saving equipment needed in an emergency. In life-threatening emergencies we will send a single responder and an ambulance crew to treat the patient. In these situations every second counts, and a single responder can get through the traffic faster than a large ambulance which means we can get treatment to a patient more quickly. However, our single responders have been fully trained to work on their own. They are emergency medical technicians or paramedics who have the skills to assess patients to see whether they definitely need treatment by an ambulance crew. In some parts of London we are supported in our work by ambulance community responders, who work for us on a voluntary basis. These are members of the public who have had emergency life-support training, and they respond alongside our staff to life-threatening 999 calls. We plan to increase the number of single responders to ensure that we are able to retain crewed ambulances for those patients who need them. Where do single responders operate? We have single responders in cars operating all across the capital. Cycle responders operate in busy locations, especially where there are large pedestrian areas. Currently, they are in Canary Wharf, Croydon, Kensington, St Pancras Station and Heathrow Airport.